Earlier this month, Father Jenkins asked University deans to find ways to amplify Pope Francis’ environmental message. The Mendoza College of Business and the new Keough School of Global Affairs are each convening major conferences this academic year. Mendoza will host “Climate Investing: Transition to a Low-Carbon World” on Sept. 29 and 30. As part of its mission, the Keough School will examine the impact of climate change on global development and foreign policy issues. Its April conference is in the planning stages. In addition, Wednesday (Sept. 23) in New York City, Notre Dame’s Global Adaptation Index (ND-GAIN) will honor its Corporate Adaptation Prize winners AECOM, IBM and DADTCO for their development of resourceful contributions to climate adaptation in countries that rank at the bottom of the index. Other upcoming events on campus are the Center for Social Concerns’ Rev. Bernie Clark, C.S.C., Lecture by Fordham University theologian Christiana Peppard titled “Integral Ecology: Pope Francis, Ethical Pluralism and the Planet”; the Center for Sustainable Energy and GreeND’s annual Energy Week, Oct. 5 to 10; a College of Science panel discussion about Laudato Si’ at noon Saturday (Sept. 26); and a presentation Oct. 1 by New York University environmental philosopher Dale Jamieson sponsored by the Notre Dame Institute for Advanced Study. Meanwhile, Father Jenkins is scheduled to attend a reception for Pope Francis Wednesday at the White House, and then concelebrate Mass with him at the National Shrine of the Immaculate Conception. Father Jenkins will be a guest Thursday when Francis becomes the first pontiff to address a joint session of Congress. Some 500 Notre Dame students, faculty and staff will join Pope Francis for an outdoor Mass on Sept. 27 (Sunday) in Philadelphia at the conclusion of the 2015 World Meeting of Families. In an effort to reduce carbon emissions from its campus combined heat and power plant, the University has reversed its use of coal from 85 percent to 15 percent in recent years, with the majority of energy input to the power plant (about 85 percent) now coming from natural gas. The campus combined heat and power plant provides not just electricity, but also steam to heat campus buildings and hot water and to serve various other processes. Steam is also used in part to produce chilled water for air conditioning. Notre Dame currently generates about 50 percent of the University’s electrical energy needs, with the other half coming through the purchase of power from Indiana Michigan Power. Over the next five years, Notre Dame will reduce its coal consumption entirely by using more natural gas in the near term and by developing other energy sources in the longer term. Geothermal applications — Numerous sites across campus are under consideration for geothermal systems to support both new and existing campus buildings. A project currently is underway to install such a system on the new East Quad. Hydro power — The University is currently working with the city of South Bend and state and federal agencies to permit and construct a hydroelectric facility on the St. Joseph River dam in downtown South Bend. The hope is to begin the project next year. It is expected to produce 7 percent of current campus electrical needs. While commitment to abandon coal altogether is new, Notre Dame has been moving in that direction for the last decade. By way of example, although a proposed 2014 EPA rule that requires carbon reductions of 30 percent by 2030 from 2005 levels does not apply to institutional power plants like Notre Dame’s, the University already exceeded that goal in 2013, when emissions from its power plant were 40 percent lower than 2005 levels. Notre Dame has also realized significant energy efficiencies through conservation. Since its introduction in 2008 of special energy conservation measures, the University’s energy usage per square foot of facilities has been reduced by nearly 23 percent. Consonant with a major university, Notre Dame’s environmental initiatives include numerous research projects. In a national television ad this past Saturday (Sept. 19), Notre Dame biologist Jen Tank was featured for her research on conservation techniques designed to prevent the runoff of farm fertilizers into streams and rivers. Center for Sustainable Energy at Notre Dame — Conducts research and education programs in energy efficiency; safe nuclear waste storage; clean coal utilization; CO2 separation, storage, sequestration and use; solar and other renewable energy; and the social, political and ethical aspects of energy policy and use. Center for Environmental Science and Technology — A cooperative effort between Notre Dame’s Colleges of Science and Engineering, fostering interdisciplinary environmental research and education by providing cutting-edge analytical technologies needed to address complex environmental problems. Environmental Research Center — Furthers research and education in environmental studies by focusing activities on high environmental quality locations that serve as “natural” laboratories for the study of environmental systems. These sites have experienced little or no degradation from humans and function as a baseline for comparison with human-disturbed systems. Center for Building Communities — The center aims to address problems such as the lack of affordable housing, suburban sprawl and the looming energy and environmental crises by generating ideas and examples for the construction and real estate industries. Center for Environmental Justice and Children’s Health — A multidisciplinary group of Notre Dame faculty, students and friends dedicated to addressing environmental injustice by performing risk assessments and environmental impact analyses in poor, minority or other vulnerable communities and helping to educate and empower potential victims of environmental injustice. GLOBES — A part of Notre Dame’s John J. Reilly Center for Science, Technology and Values, GLOBES brings together biologists, environmental and social scientists, public policy experts, lawyers and religious and community leaders to seek innovative and interdisciplinary solutions to a wide range of interrelated problems in environmental and human health. Environmental Change Initiative — The initiative’s research tackles the interrelated problems of invasive species, land use and climate change, focusing on their synergistic impacts on water resources. ND-ECI provides new intellectual capital and infrastructure for interdisciplinary teams of faculty to help solve complex environmental problems identified as “Grand Challenges” by the National Academy of Sciences. Mandela Washington Fellowship for Young African Leaders — The program extends the idea of business for good by helping to educate the next generation of African leaders in ethical leadership, business and entrepreneurship. Each summer, 25 young African leaders, representing 19 countries in Africa in 2015, arrive at Notre Dame to learn from faculty on how to grow their businesses in a socially sustainable way that respects human dignity. Notre Dame Initiative for Global Development’s Connectivity, Electricity and Education for Entrepreneurship — The CE3 project is working directly with the local Catholic community in Northern Uganda and BOSCO Uganda to help people who were displaced in Uganda during brutal violence instilled by the Lord’s Resistance Army rebels, which resulted in 2 million people being displaced from their homes and tens of thousands kidnapped, mutilated or killed. CE3 works to empower these communities by harnessing solar energy to deliver clean, efficient, renewable power to off-grid communities, significantly reducing reliance on diesel-powered generators. In addition, the Initiative for Global Development, in partnership with the Blue Planet Network and International Lifeline Fund, is conducting an impact evaluation in northern Uganda to measure the socioeconomic and health status of the population in the villages in Uganda due to the provision of new clean stoves that can reduce pollution and health risks in villages. Notre Dame Initiative for Global Development’s USAID/ND Global Development Fellowships — The program sends Notre Dame graduate students to developing countries to work directly with local organizations to help solve global development challenges that can improve the lives of the poor and lead to better humanitarian responses to conflict and environmental stewardship. Advanced Diagnostics and Therapeutics — AD&T is focusing on technological solutions to develop new tools that can help address environmental problems, particularly pollution. Center for Low Energy Systems Technology — A part of NDnano, LEAST is driving a nine-university collaborative effort to reduce the power dissipation in electronic systems. The origin of Notre Dame utilities dates to the late 1800s when a steam plant adjacent to the Main Building served the small campus. Near the turn of the 19th century, a new steam plant was built on what is now the site of the University Health Services in Saint Liam Hall. 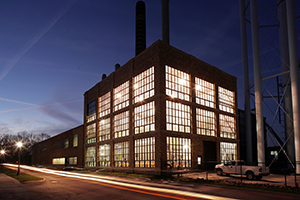 The plant’s current site on the north side of the campus was first occupied in 1932, and there have been eight expansions over the last eight decades, including the additions of seven generators, six boilers, seven chillers and air quality control systems. Originally published by Dennis Brown at news.nd.edu on September 21, 2015.